I promise I’m not going to present you a lengthy recap after every single tri workout, but today was the first. So you’re gonna get a lengthy one today. It was just… wow. Wow hard, wow good, wow scary, wow humbling, just wow. Our little triathlon team is about 18 people in the SF Bay Area. Today we traveled out to a middle school in Pleasant Hill, about 30 miles from where I live, for our first combo swim/run workout. First the swim coach gave us a demo of what our swim stroke is supposed to look like: head down, body aligned, blowing out bubbles at all times, and what she called the “catch-up Michael Phelps” stroke. So the “base” of the stroke is that you’ve got both arms extended straight out, arms at ears, and the hands are actually sort of crossed over one another. Then you remove one arm to come down and stroke and immediately return it to that position, and then you do the other side. She asked us to position ourselves based on our own level of experience and I headed to the most “developing” (ie beginner) lane. Which turned out to be exactly where I needed to be. This was not a surprise or particularly devastating since I have, as I said before, not swum laps in 18 years. So we get in, and there are 2 other women in my lane, and our coach (there was one coach for every 2-3 lanes) said, “Just go back and forth.” Um o-kay. I took off from the wall trying to be all Michael Phelpsish. We went back and forth a bunch of times. I was happy that my goggles are AWESOME (they aren’t prescription but they have corrective lenses and I could actually SEE clearly). By the 4th length I was panting. Way pooped. I was somewhat relieved to see that my lanemates were also short on the oxygen. Then we did a bunch of drills during which we did lengths where we only kicked (no stroking) – that was hard, and some where we had our arms down by our sides (that was hard too!). Then we did 4 LAPS (back and forth) and then we did 4 LENGTHS. Um, dude, that’s a lot of swimming. I found myself getting ridiculously thirsty and thank goodness I had my water bottle at the side of the pool. One of my knees also complained a bit. But at the end of an hour (an hour!!) I felt like I was almost starting to get the hang of it. I was tired, but I also felt like I could’ve gone on. But then it was time to run. We went into the girls’ locker room to change and it was a bit of a challenge putting running clothes (ie sports bra) on a somewhat wet body. Whatever. We went out to the track and did a bit of dynamic warmups – skipping, knee-ups, lunges, grapevines, basketball side running things and the like. Whew! That was pretty tiring. Then we were to do 4 laps around the track (1/4 mile each) BUT we were supposed to “stride” (pick up the pace) during the straightaways. Which is about half of it. Intervals! Brutal intervals. They made me feel kind of pukey. But I did it. Then when we finished that, he said, “OK, now you’re going to do a timed mile.” They had given some sort of lip service to this notion of run-walking, but believe me I think about 90% of this team was RUNNING. And I mean running. Like 7-8 minute miles kind of running. It was clear that my leisurely little jogging/wogging pace was going to put me flat at the end. Where I did not want to be. I discussed this with Mr M before leaving today. In most of my timed races I find myself around the final 1/3 of the crowd. Which is just fine. But this is a very fast, young crowd. I tried very hard to stay focused. To keep my own pace. To not worry that I was getting lapped by the younguns. I just tried to keep my head up and keep running. But MAN. It was humbling. They did say we might want to “kick it out” for the final straightaway and I did just that. I kept at my slowish pace until the very end and then I sprinted in, punch in the gut style. It was sobering. It was humbling. It was kind of exciting to know that I was running with the big dogs (actually, the young dogs) and sort of holding my own. But it also showed me that this is going to be no walk in the park. This workout (3 hours total) was NO JOKE. 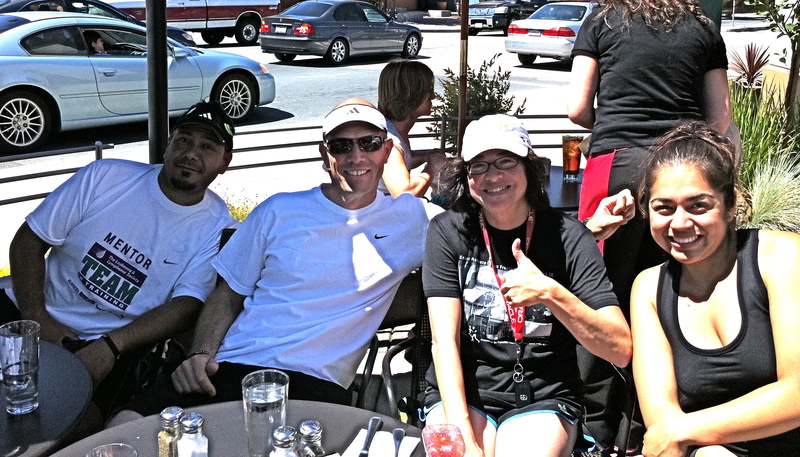 After the workout a group of us went to a nearby cafe for brunch (we were finished at 11am!). I was in a bit of a stunned state. Part of me was like, OMG WTF did I get myself INTO? And part of me was like Go Ito, you did this. You didn’t drown or fall down or anything traumatic. You kept up. You stayed in the range. Coach Haaken next to me. He means business! 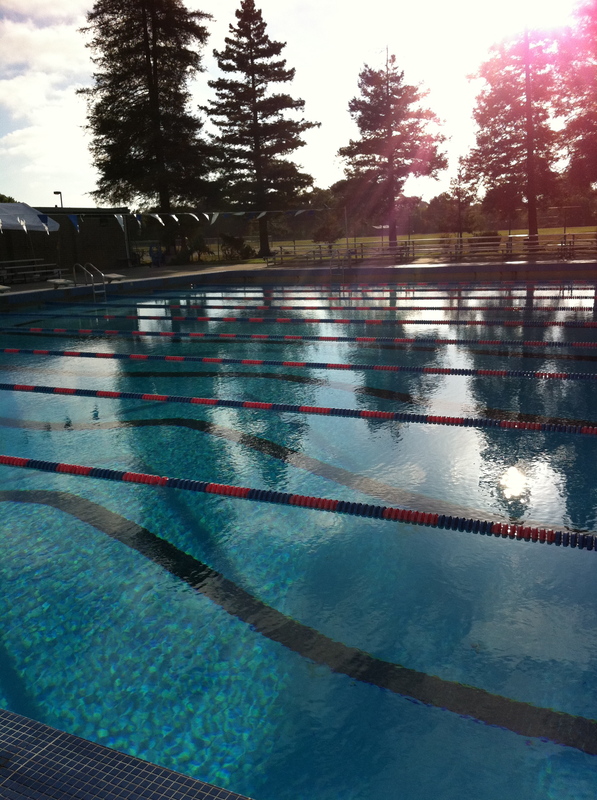 The weekday workouts are much shorter versions and we’ll be doing 2 run, 2 bike, 2 swim (with one rest day, Mondays) on our own. The weekend workouts are going to be the long ones. I guess this is what my weekends are going to be looking like for the next few months. I’m excited. And I’m also a bit in state of shock. The other part of this, of course, is fundraising for the Leukemia & Lymphoma Society. I have a bunch of really, really fun events planned locally. I’m going to be guest bartender at a local bistro on August 11th and they’re donating a generous percentage to my fund! (any and all invited!) Other fun things are in the works. Stay tuned, and if you can’t make a local event, please please please consider giving a little or a lot here. Wow! That is intense! What distance are you training for? Because if you’re doing 3-hour swim/run workouts, you already have more than enough stamina to finish a sprint tri. With that kind of training, you are seriously going to rock your first tri. Well, they’ve been saying this is the training for either, and it will sort out in September, but clearly NOBODY in this group (except maybe me) is aiming for the sprint. We already exceeded the minimum “requirements” for the Olympic. I’m feeling both encouraged and scared. This is no joke! Wowsers! I sure look forward to hearing more about your training! I am in awe of what you are doing! I think it’s fantastic and so courageous to challenge yourself like this. As always, you are an inspiration. A-MAZING! You are awesome. Let us know how your body is doing Monday! how are you feeling this morning?? AND NEVER SAY “I wont go into a lengthy recao” 🙂 we love yer lengthy recaps. My shoulders are a little achey. All that Michael Phelps action! But otherwise fine. I am glad it’s a rest day. But then starting tomorrow… it’s 6 in a row! Zowee! Awesome- I really, really want to do a tri one day. I’ve got the swimming down (have been swimming 1 mile 3 times a week recently) but the running and biking? Heck nah. Me and my 18 minute mile wogging pace from my half-marathon is like a turtle compared to your speed! Great job. I keep meaning to at least try a spring length triathlon in my town, but I hate the training part of it, especially the lap swimming. I just don’t know if it’s in me. You’ve inspired me to reconsider. Luckily, I have until April 2012 to make a final decision. LOL! I hated the idea of the “training part,” too, which is why I signed up with Team in Training. I knew I’d never ever do it on my own! wow. i could NEVER do all that. that’s so much! my body would shut down! (even if i knew how to swim!). youre doing awesome! Yes!! I love to hear the recaps!!! Tell us more more more!! I’m going to attempt a sprint tri next year, so I’ll have questions! And you did that run after the swim?????? AMAZING!!!! So proud of you!!!! Wow. Congratulations. I wish I could do that.